Little Torrington Parish Church History, Part 4: the wrong name? Question 13 asked; “To what Saint [is your parish church] dedicated? Question 25 echoed this; “What Wakes, Parish Feasts, or Annual Processions [are there in the parish]?”, as the answer was “An Annual Feast on Ascension Day or the preceding Sunday”. I had naively assumed that churches were always dedicated to a saint of some kind, but it turns out that some were dedicated not to a saint, but to the date on which they were originally dedicated. The current Church of England website lists all the parish churches in England, some 16,139 are listed in all (about 800 being in Devon & Cornwall); a curious church-goer has recently done an analysis of the dedication saints of all of those listed with some surprising results. There are 446 different dedicatees, of which the commonest is St. Mary (or St. Mary the Virgin) with 2,231 in all, closely followed by All Saints with 1,425 churches, St. Peter with 1,327 and St. Michael with 816. [Some churches are dedicated to multiple saints, and these are counted in the totals for each saint.] Dedication dates, far rarer than saints, are also included in the list, with churches dedicated to the [Feasts of the]: Ascension (51), Assumption (20), Resurrection (12), or Epiphany (10). I had to look up when Ascension Day is; it is defined as “the day on which the Ascension of Jesus Christ is commemorated – the Thursday but one before Whitsuntide, Holy Thursday”. So I had to look up Whitsun; it is “the seventh Sunday after Easter, commemorating Pentecost”… [Pentecost also being the 50th day from the second day of the Jewish Passover Festival...] And I thought that calculating the date of Easter Day was complicated! “Perhaps his [Oliver’s] most surprising error [in his 1846 book] was to identify a reference to the chapel of St. Giles in Great Torrington parish with Little Torrington. The latter was a distinct parish; the chapel was St. Giles in the Wood”. In other words, Oliver was trying to find the original Saint to which Little Torrington church had been dedicated, and leapt to the [wrong] conclusion that it was St. Giles, as he had not realised that there was already a correctly named St. Giles in the Wood chapel in Great Torrington parish, and that our church was not in Great Torrington parish at all! Significantly, Professor Orme did succeed in finding one early reference to the church in Little Torrington; it was noted as the church of St. Mary’s in a 1486 AD document in the “CIPM, Henry VII, 1, 65”. The CIPM – “Calendar of Inquisitions Post Mortem, Henry VII” – was published in 3 volumes by the Public Record Office between 1898 & 1956, and publishes in some detail the texts of important people’s wills and their heirs prior to Henry VIII’s 1530s Reformation. In the CIPM, series 2, volume 1, can be found the PM Inquisition of “Anne, late the wife of Thomas Ormond, knt.”, and the 25/26 July 1486 inquisitions listed her sizeable land-holdings and properties all around Devon including; “The fourth part of a toft [homestead], 20 acres land, and 1 acre wood in Little Toryton, with a fourth part of the advowson [patronage] of the church of St. Mary, Little Toryton, and the advowson of the chantry, or chapel, of St. Mary Magdalen, in Tadyporte, worth 2s-6d, held of John Davyles, by fealty only…” So this is the earliest reference so far traced to Little Torrington church and it shows that it was, in 1486, dedicated to St. Mary (the mother of Jesus as opposed to Mary Magdalen). In other words, Anne had a patron’s 25% vote on each new Little Torrington vicar when there was a vacancy; this ‘advowson’ (patronage) could be bequeathed and/or sold or given away. That leaves us with the intriguing question; should Little Torrington parish church continue to be known as St. Giles, or should it be St. Mary (or perhaps “St. Mary & St. Giles”)?? Rev. Peter Bevan was not as worried about this discovery as I had thought he might be; the Victorians apparently made this kind of mistake in many villages around England, when they were busy rescuing the old church buildings from collapse or becoming derelict. We should be grateful that they were better builders than historians! After all, what’s in a name? From the Churchwardens – what do you think? Should we incorporate St. Mary into our name? 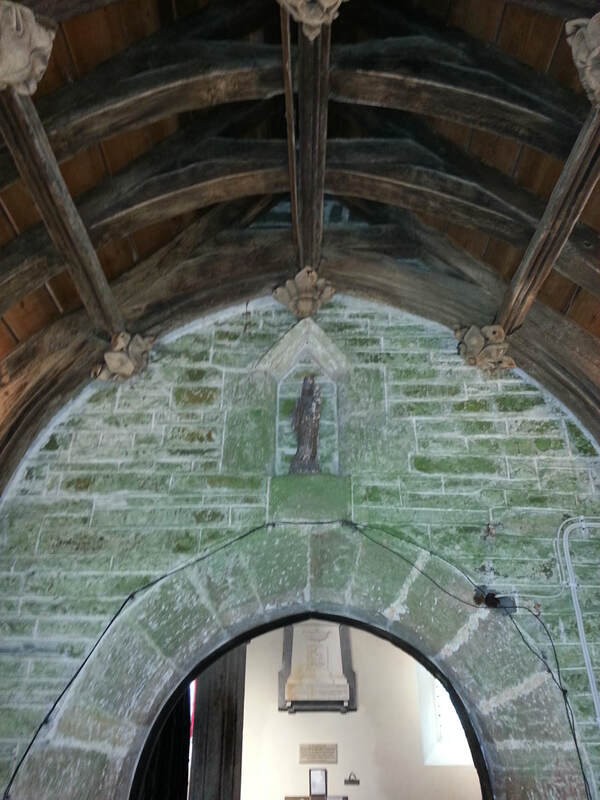 There is an old, but not valuable, plaster statue of her which we believe used to stand in the alcove above the church door…. Should we reinstate it? Please do let us know your thoughts….